﻿ Environmentally Friendly｜Sustainability｜DAITO KASEI KOGYO CO., LTD. In 2007, we acquired KES Certification for our Okayama Plastic Factory and have continued to renew and maintain this in the following years. Starting in spring 2017, we have begun preparations to acquire ISO14001. We hope to have completed this by 2020. In addition to these, we have enacted an environmental policy and are developing a wide range of products with a low environmental impact. As of 2017, we now offer more than 60 products that have acquired the ECOCERT and COSMOS certifications which attest to a product’s environmental friendliness. Our MAKIBEADS ECO and ECOFIBER series use polylactic acid, a compostable plastic that originates from plants. 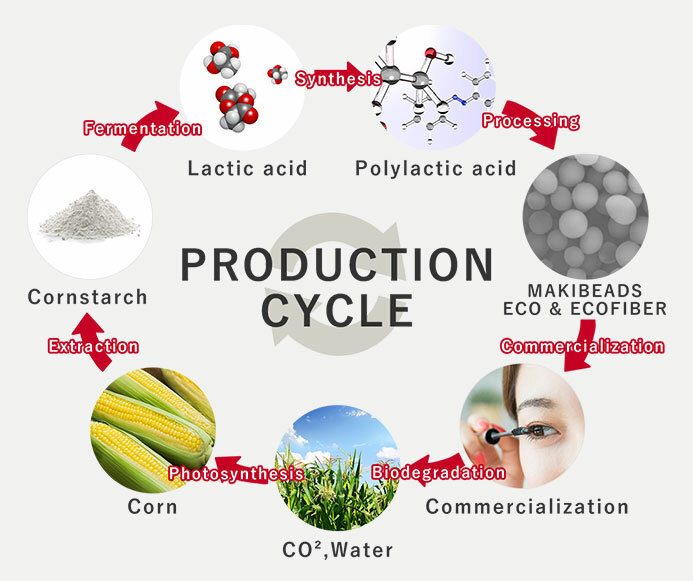 This material has been gaining attention as a substitute for the micro plastic beads that have been a source of environmental troubles in recent years. Our CELLULOFLAKE and CELLULOBEADS series use FSC-certified/PEFC-certified traceable wood or lumber acquired through forest thinning projects. We make sure that none of the wood we use for our raw materials is derived from unplanned logging or deforestation.